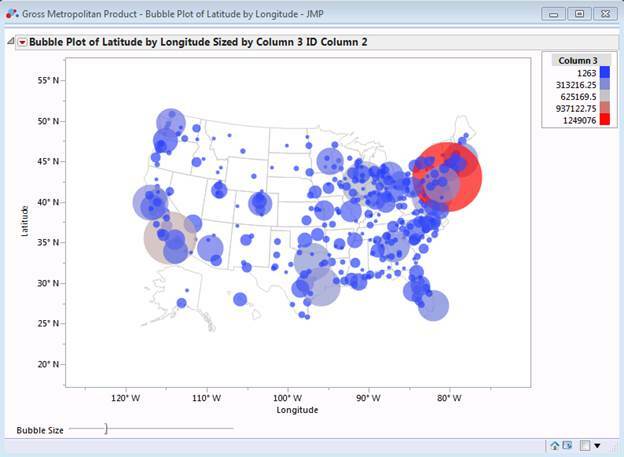 JMP has the rather powerful capability to construct visualizations based on geographic data. 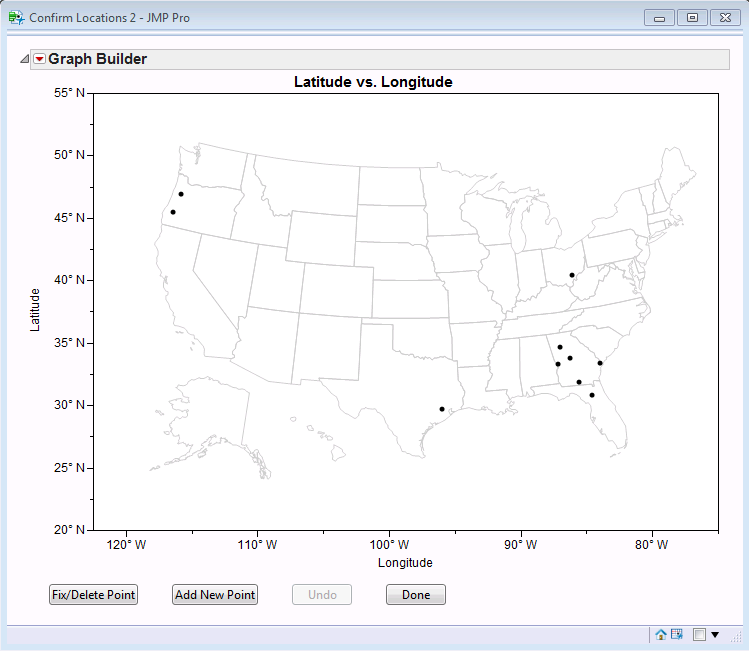 However, in most cases JMP requires latitude and longitude coordinates for each item in order to map it. That many data sets lack this information limits the visualizations you can construct without individually finding coordinates for each item. For example, JMP would not be able to show a map of the following data, despite each row having a location clearly defined. This data is pulled from a large set of gross metropolitan products for major US metro areas from the US Bureau of Economic Analysis and is used throughout this post. 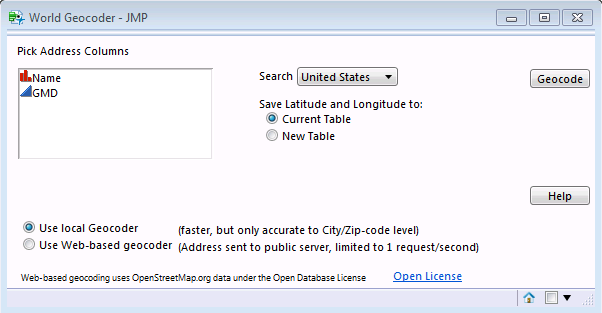 In order to use the mapping capabilities of JMP on this data, it is necessary to transform these location names or addresses to latitude and longitude coordinates, a process called geocoding that can be tedious to do manually. This summer, a JMP intern wrote an add-in that automates the geocoding process by parsing the location text to find relevant information -- like country and city name -- and attempting to match that information against either built-in tables or the online services of OpenStreetMap.org. You can download the JMP Geocoder add-in from the File Exchange. These 10 cities were pulled from a list of cities in the state of Georgia, but without any identifying items that show they are from that state. Because the geocoder sorts in order of decreasing population, it will find more populous cities first if the city location is ambiguous. Here, for example, Houston, Texas, would be found before Houston, Georgia because no state was specified. These options allow you to change this point if the geocoder originally found it incorrectly. In this example, let's use the "Try Again" button to choose the next matching location, which in this case is Houston, Georgia, the location we wanted. This same operation can be applied to the rest of the incorrect points on this map. Sometimes -- like Winston, Oregon on this map -- you have to try several times to get the result you want. This is because the geocoder weighs population and name type in its decision, it will find a town name before a county or region name, and a more populous place before a lesser one. If you go through and fix each of the points, you will get a map resembling the following, with all points within Georgia, just as we wanted. 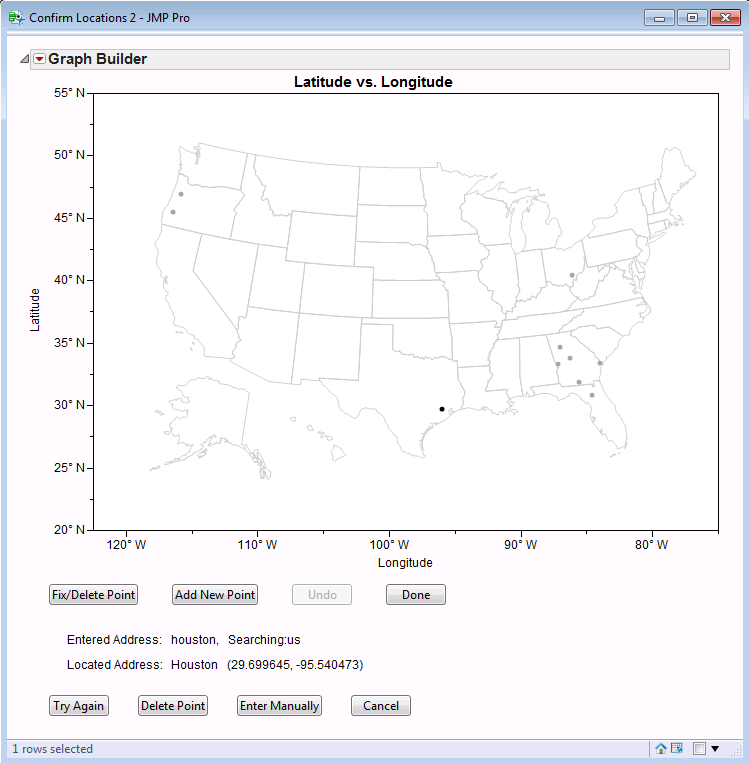 Download the JMP Geocoder and try it on your data. And if you've never used JMP before, try it free. I am having trouble installing this add-in. Has anyone else had difficulty installing this add-in? What appears to be the problem? One thing about this add-in is that it requires around 150 MB of free space. Vietnam, VN seems to have the wrong GPS coordinates. My challenge is I have some random locations (which have no latidudes and longitudes) of South Korea which I want to present in form of dot-distribution-map as shown in the first map above. When I imported the shapefile that I have, the jmp could not read it. I would be grateful if anyone can assist me with a South Korea shapefile that is compatible with jmp.